← Enough is Enough…Isn’t it? 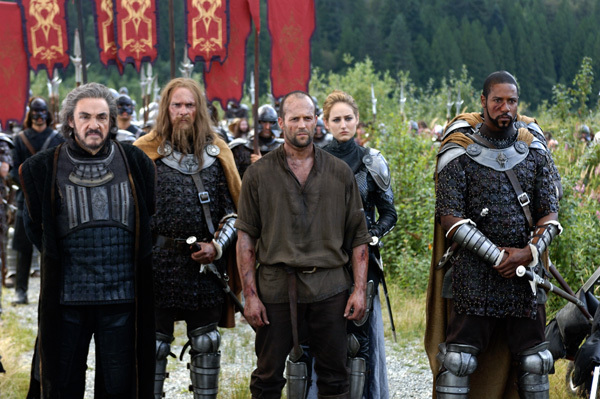 In the Name of the King: A Dungeon Siege Tale is a fantasy action film directed by Uwe Boll in 2006, apparently inspired by the Dungeon Siege video games. 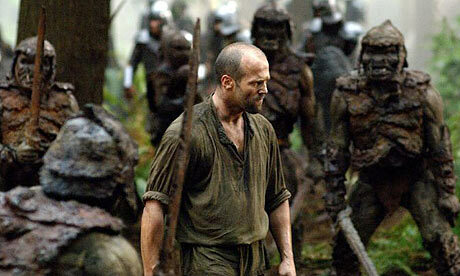 Set in the fictional kingdom of Ehb, the story follows a man called Farmer (Jason Statham), an orphan who was adopted by a village…seemingly the only village in this fantasy land. When Farmer’s wife, Solana (Claire Forlani), and his son leave to sell vegetables at the town of Stonebridge, his farm is attacked by creatures called Krug (If you don’t know what a Krug is.. think Uruk-hai from Lord of the rings, but far lamer looking and noticeably shorter/unimposing.). With the help of his friend Norrick (Ron Perlman), he fights off the Krug and travels to Stonebridge. However, the Krug manage to kill his son and capture his wife. 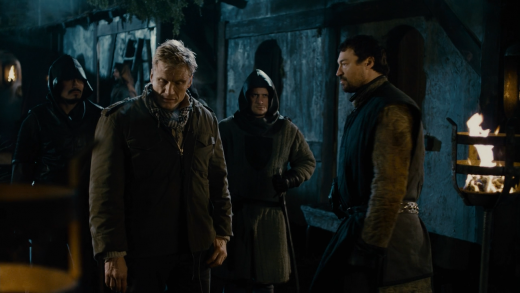 Accompanied by Norrick and Bastian (Will Sanderson), his brother-in-law, Farmer intends to find and rescue his wife. The Krug are being controlled by the wizard Gallian (Ray Liotta) who is amassing an army to overthrow King Konreid (Burt Reynolds), with the assistance of the King’s nephew, Fallow (Matthew Lillard). That’s basically the gist of the movie. This is what a budget of $60 million seems to get you in Hollywood. This movie obviously boasts some well known actors, such as Ron Perlman (Hellboy), John Rhys-Davies (TV’s Sliders, Lord of the Rings), Burt Reynolds ( The Longest Yard, The Dukes of Hazard) and so on, so you would expect that this movie would be epic or at least nearly epic, right? Well you’d be mistaken; sadly mistaken. From the beginning, this movie seems to have been pieced together out of weak plot and sad effects. If I didn’t know any better, I’d think this movie solely relied on the big names of its actors, not its script, effects, plot, and overall feel. I guess I don’t know any better because that’s just what I think. Don’t get me wrong though, this in no way is me badmouthing the actors in this film. Each and every one of them played their part perfectly, but even well trained and experienced actors can’t turn trash into gold. If that’s something you didn’t know before, take a look at “In the Name of the King: A Dungeon Siege Tale” and you’ll find it out for yourself. After watching the movie in its entirety, the only thing on my mind was how soo much money produced such a substandard film. I’ve seen movies with noticeably smaller budgets and less well-known actors in it that could run circles around this piece of fantasy garbage. There’ve even been Sci-Fi originals made by the Sci-fi(now Scy-fy) channel that were more enjoyable and well thought out than this film. If this movie in of itself wasn’t bad enough…. there’s a sequel. That’s right.. a sequel. Now.. I’ve yet to see the sequel titled “In the Name of the King 2″(to the best of my knowledge that’s the title), but here’s what Wikipedia says about the film: “Uwe Boll has confirmed that the film will have a time travel story where Dolph Lundgren will play a former military officer who is attacked by ninjas and sent through a time vortex where he gets stuck in medieval times. Boll has also gone on to confirm that a dragon will be included in the film.” If the first movie wasn’t ludicrous enough (and it was…. oh how it was.) then this must surely be more-so. I mean Ninjas, time vortexes, dragons, and Dolph Lundgren? How could this get any more ridiculous? Wait.. they could throw in trained bears that dance around whilst preforming acts of acrobatics on giant red rubber balls, but that’d be overdoing it just a bit, don’t you think?